I am still a few days behind but should get caught up today since we have the afternoon free. On Tuesday we spent the day in Bethlehem and on Tuesday we toured the Mount of Olives and Mount Zion. Everyone is doing very well. No problems at all! More soon. Here is Monday — our morning in Galilee and our drive south, up to Jerusalem. We just found out that our favorite restaurant in Israel is now owned by a Christian. Aberge Shulamit is a great place to take our pilgrims for an elegant, gourmet dinner. The best wine from the Golan Heights, exceellent smoked fish and meats and scrumptious appetizers and desserts. On the way home we have a “Comedy Club” on the bus with everyone telling their favorite clean jokes. 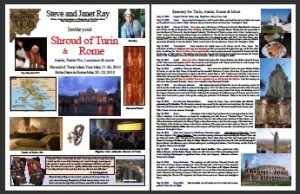 Join us to See the Shroud of Turin, Rome, etc. We now have our pilgrimage planned and YOU can register! The brochure is ready! The Pope has decided to bring out the Shroud of Turin in Italy AND WE WILL BE THERE! You can join us! It is only displayed about once every 25 years so this is truly a chance of a lifetime. We will see with our own eyes the cloth used to cover our Lord at his burial and layed aside at his resurrection. We will also visit Assisi, the Eucharistic Miracle of Lanciano, the incorrupt body of St. Padre Pio at San Giovanni Rotonto, and visit Rome. Click here or on the image to download the brochure.